The Musashi's sister ship, the Yamato, nearing completion in 1941. One of the world’s largest and most advanced battleships was discovered this week. A research team led by Microsoft co-founder Paul Allen claims to have finally found the wreckage of one of the world’s largest and most technologically advanced battleships sunk during the Second World War. On March 2, Allen posted images on Twitter that seemed to show the Musashi, an Imperial Japanese Navy battleship. The Musashi was sunk by American forces on October 24, 1944 in the lead up to the Battle of Leyte Gulf in World War II, one of history’s largest naval battles. The images posted by Allen included a photo of the ships bow clearly bearing the chrysanthemum crest of the Japanese imperial family. Kazushige Todaka, the director of Japan’s Kure Maritime Museum also told CNN after viewing the information that it appeared to be the Musashi. The Musashi was one of two Yamato-class battleships built by the Imperial Japanese Navy, considered the heaviest and most powerful armed battleships ever constructed (Robert Farley has written about the Musashi’s sister ship, the Yamato, for The Diplomat magazine here). 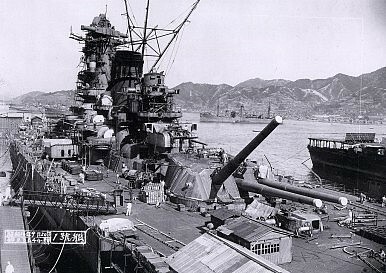 Commissioned in 1942, the Musashi weighed around 73,000 tons fully loaded, was nearly 900 feet in length, and was armed with nine 45 Caliber 46 cm Type 94 main guns, the largest guns to ever be mounted on a warship. They dwarfed their U.S. equivalents of the day, and the World War II Database has some historical accounts of U.S. personnel marveling at its sheer size. “[Musashi] was huge!” exclaimed gunner Russ Dustan of the USS Franklin. “I had never seen anything as big in my entire life. It was a magnificent sight”. Allen also tweeted that a remote operated probe launched from his luxury yacht and exploration ship, the M/Y Octopus, had found the Musashi at a depth of one kilometer on the floor of the Sibuyan Sea off of the Philippines. Previously, the Musashi’s location had remained a mystery despite multiple eyewitness accounts; Allen and his team had been searching for it for more than eight years. The discovery also comes as the world commemorates the 70th anniversary of the end of WWII. Todaka, the museum director, said the timing offered the world a chance to reflect on the war. “It’s fateful that the discovery was made on the 70th anniversary of (the end of) World War II. The memory of the war has been fading away after 70 years, and the survivors of the war are disappearing. It is very meaningful discovery and a good chance for us to remind ourselves about the war and its tragedy,” he said. The brief look at the story behind the largest battleship ever constructed in naval history.